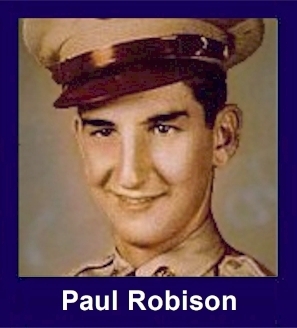 The 35th Infantry Regiment Association salutes our fallen brother, PV2 Paul L. Robison, RA16310479, who died in the service of his country on September 15th, 1950 in South Korea. The cause of death was listed as KIA. At the time of his death Paul was 18 years of age. He was from New Albany, Indiana. Paul's Military Occupation Specialty was 4745-Light Weapons Infantryman. The decorations earned by PV2 Paul L. Robison include: the Combat Infantryman Badge, the Distinguished Service Cross, the Purple Heart, the National Defense Service Medal, the Korean Service Medal, the United Nations Korea Service Medal, and the Republic of Korea War Service Medal. Private Robison was a member of the 35th Infantry Regiment, 25th Infantry Division. He was Killed in Action while fighting the enemy in South Korea on September 15, 1950. Private Robison was awarded the Purple Heart, the Combat Infantrymans Badge,the Distinguished Service Cross, the Korean Service Medal, the United Nations Service Medal, the National Defense Service Medal and the Korean War Service Medal. The President of the United States takes pride in presenting the Distinguished Service Cross (Posthumously) to Paul L. Robison (RA16310479), Private, U.S. Army, for extraordinary heroism in connection with military operations against an armed enemy of the United Nations while serving with Company F, 2d Battalion, 35th Infantry Regiment, 25th Infantry Division. Private Robison distinguished himself by extraordinary heroism in action against enemy aggressor forces near Chirwan-ni, Korea, on 15 September 1950. While occupying a defensive position along the Nam River, Company F was attacked by a numerically superior enemy force. Under cover of intense small-arms and automatic-weapons fire, the enemy approached to within grenade range of the company positions and succeeded in knocking out two friendly machine-gun emplacements. When it became obvious that the company would not be able to hold its positions against the overwhelming enemy attack, the order was given for the company to withdraw. Private Robison and a comrade volunteered to remain in position and cover the withdrawal of the company. With complete disregard for his personal safety, he remained exposed to the deadly hail of enemy fire and courageously held the enemy at bay until he was killed.